LaserWeb allows laser engravers and cutters to be more like what most of us expect from our tools: a fully open-source toolchain. For example, to start using LaserWeb on one of those affordable 40 W blue-box Chinese laser cutters the only real hardware change needed is to replace the motion controller with an open source controller like a SmoothieBoard. The rest is just setting up the software and enjoying the added features. If you’d prefer to roll your own machine from scratch, we have a list of helpful hints on homebrewing a system. Since handling exhaust is always an issue, check out this DIY fume extractor and filter setup for a laser cutter that took advantage of some items from IKEA. Thanks for the tip, [Peter]! Laserweb is truly awesome. You also want to take a look at Visicut for your software options, it’s also very good. Now he has his laser cutter up and running, he could trim the masking tape (around his air conditioning on the background) to size. Sorry, I could not resist. But seriously, thanks for the demonstration video. interesting to watch. Well, I first though it was a big radio stuck in front a window. But this makes more sense. Donald Papp – I love this idea. Unfortunately it’s really off point IMHO. Only the smoothy board upgrade would let this work.. Being that a k40 varies in price from $600 a few years ago, to about $400 when they are on sale, and the smoothy board is $100 USD. Just to say, there is a lot more to a cheap laser upgrade then this post imply. Smoothie allows for faster speeds, better raster/bitmap engraving results, and adjusts power to speed when accelerating better, though. Plus all the rest of the additional features, the documentation, the large community, etc. Really cheeky I know but I am planning on a similar conversion. Do you have a wiring diagram available for the conversion that you carried out? then found Laseraxe also from china that uses 2 motors but controlled by grbl (so i can also use laserweb) it has bigger work area. Thanks for the great video. 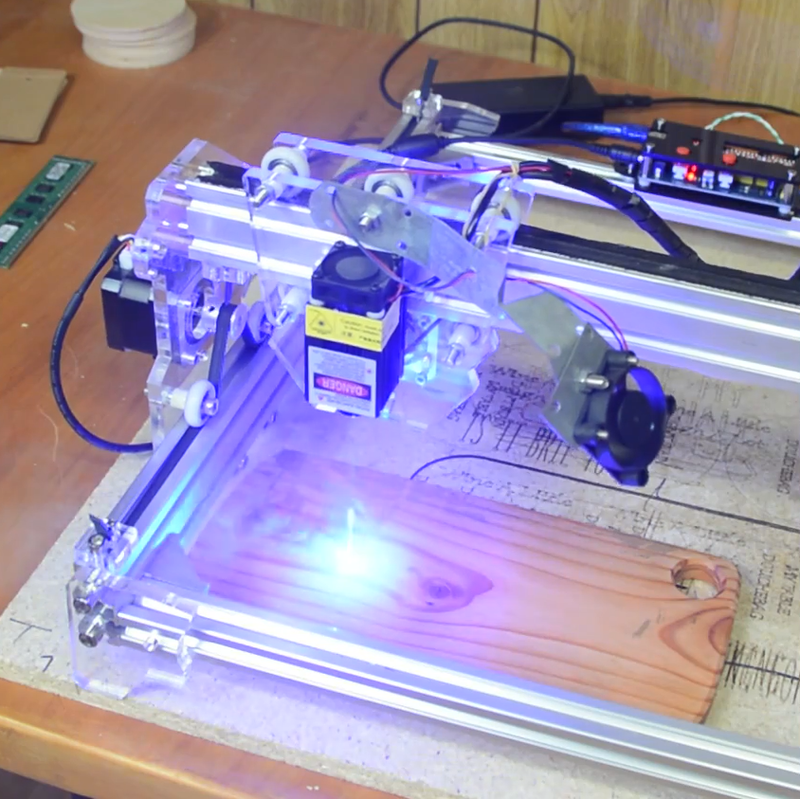 I will have to try this on my laser engraver as the software is not working correctly. I am not sure if it is because I am using an old computer (Windows XP) or if it is the machine itself. Thanks again. Thanks for the video. I do have a question about how to get my laser to turn off. Any ideas on how to fix it? I plan on using a desktop cnc and replacing the dremel tool with the laser head …I have been using grbl sender with the m3 on /off controlling the dremel tool motor through a relay…my toolchain is corral draw to convert color to gray scale /black/white than fengrave to convert the dfx from corral draw to gcode now if the laser uses variable power out than I will have to go to an open source controller.